An easy and simple recipe that combines coconut and dark chocolate for a deliciously rich and sweet treat minus the guilt! Exactly 14 months ago I gave birth to a beautiful baby girl named Abigail. She has quite the personality and is always full of energy. The girl is also non-stop all day long unless she’s sleeping. Along with my precious baby girl, I was also “gifted” with some baby weight. After my previous pregnancies, I never had a hard time losing the weight I had gained. However, this time around it has been super hard. I’ll make great progress, but shortly after I fall back into old habits and find myself at square one again. Can anyone else relate? I’m sure I’m not alone. My plan this year is to make smarter choices which include, eating more whole foods, drinking more water and switching from sugar to a natural sweetener like Truvia. That’s why today I’m sharing a healthy chocolate alternative for those of us that are trying to make better choices in the new year, but still need a chocolate fix. If you can’t find shredded unsweetened coconut (like me), feel free to grab unsweetened coconut flakes and simply break them down in a food processor. 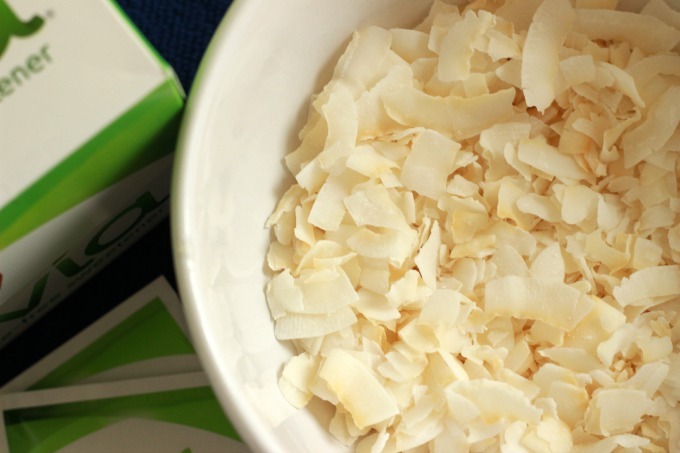 In a separate bowl blend the coconut oil, lite coconut milk and Truvia with a hand mixer. Next, add the shredded coconut and mix well. Roll mix into 1” balls, set on waxed paper and place in fridge until they are firm. In the meantime, melt the dark chocolate. 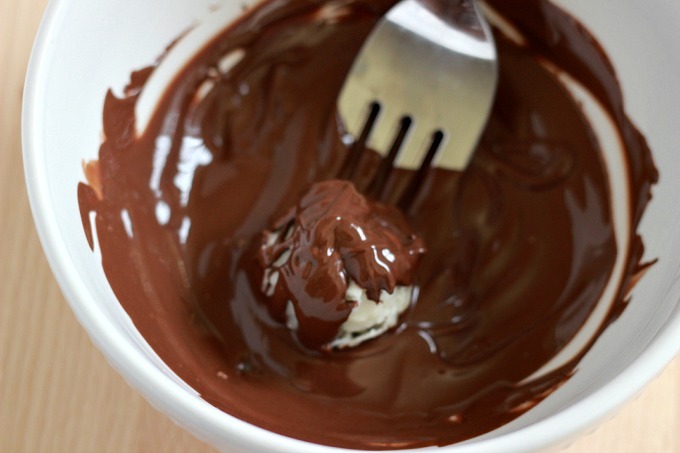 I find that melting in 15-30 second intervals in the microwave is the best way to melt chocolate without burning it. Next, dip the coconut balls in the melted chocolate, coat well and place back on the waxed paper. I use either a fork or toothpick to dip. 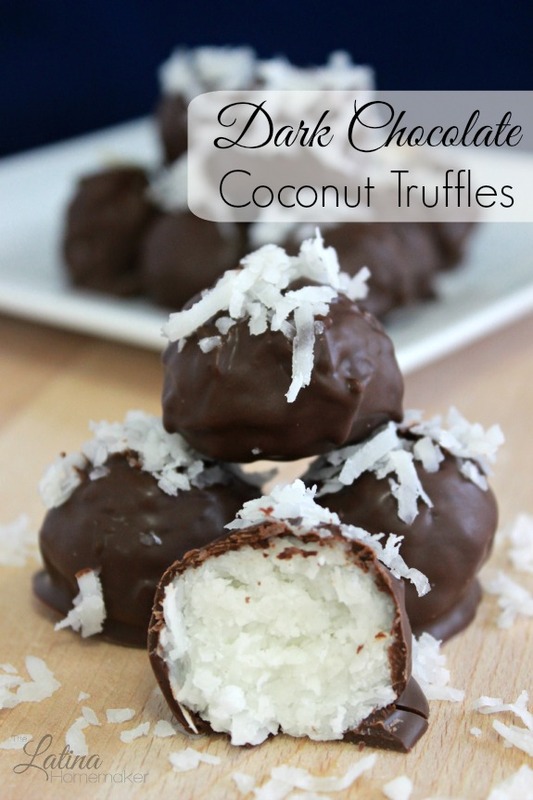 You may also add some of the shredded coconut on the truffles before the chocolate hardens. Place the truffles in the refrigerator, they will taste better when eaten cold. This recipe yields approximately 12 truffles. Are you making smarter choices this year? I would love to hear from you! 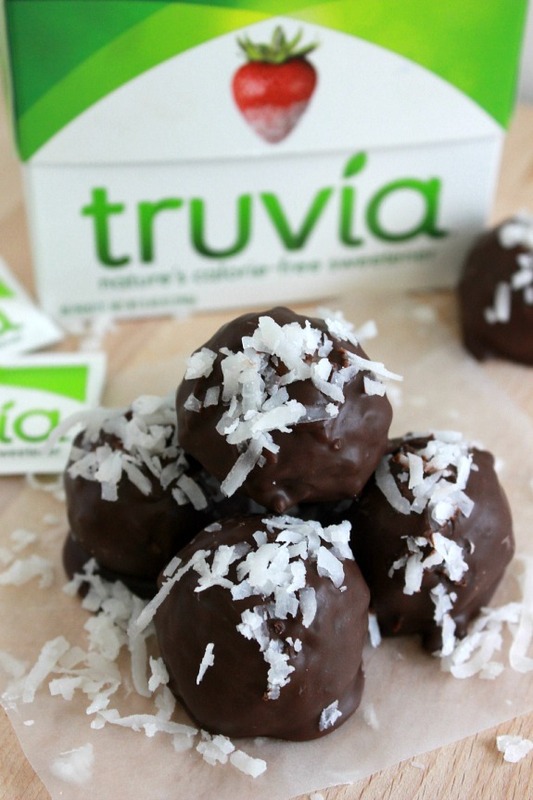 Blend the coconut oil, lite coconut milk and Truvia with a hand mixer. Add the shredded coconut and mix well. 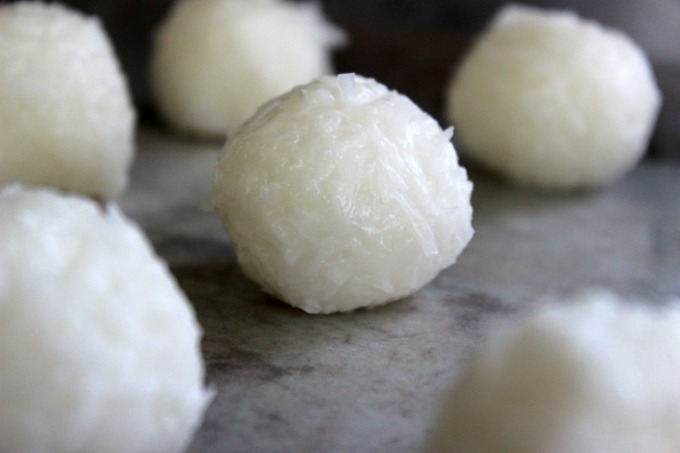 Roll mix into 1” balls, set on waxed paper and place in fridge until they are firm. In the meantime, melt the dark chocolate. I find that melting in 15-30 second intervals in the microwave is the best way to melt chocolate without burning it. Place the truffles in the refrigerator, they will taste better when eaten cold. I LOVE how healthy these are!!! What a great recipe, thank you! Hi Gary. I used approximately a 1 1/2 cups of dark chocolate. It will just depend on the chocolate you choose since some chocolate doesn’t melt as smooth as others so you wind up having to use more. Where can I find the ingredients for these truffles ? Is the coconut milk in a can? Hi Kathi. The one I purchased came in a can and I found it in the organic foods section. Are you using dark chocolate baking chips or a dark chocolate bar? Hi Mindy! I actually used dark chocolate wafers that I was lucky to find, but I’ve also used dark chocolate chips in the past which are much easier to melt than a bar. Just heat it up in small time increments if using a microwave so it doesn’t burn the chocolate.